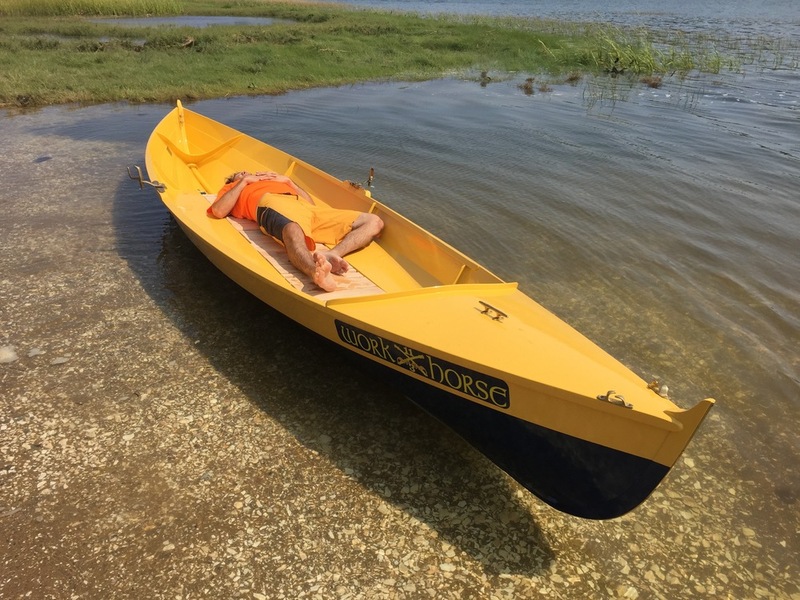 Once the 17-foot Drake Rowboat was one the water a year or so, I began thinking about a larger version that would be as exceptionally seaworthy and fast, but more suitable for tandem rowers or a single rower who wanted to take gear and do some camp-cruising. The idea stewed until a customer came along who saw the design brief for the D19 and said, "that is my boat". Unfortunately he is a hermit and off-the-grid so pictures and stories have been very hard to pull out of him! But the sea trials went fantastically. The 19 is very stable -- easy enought o stand in -- and self rescues easily with the side tanks and flotation in the bow. 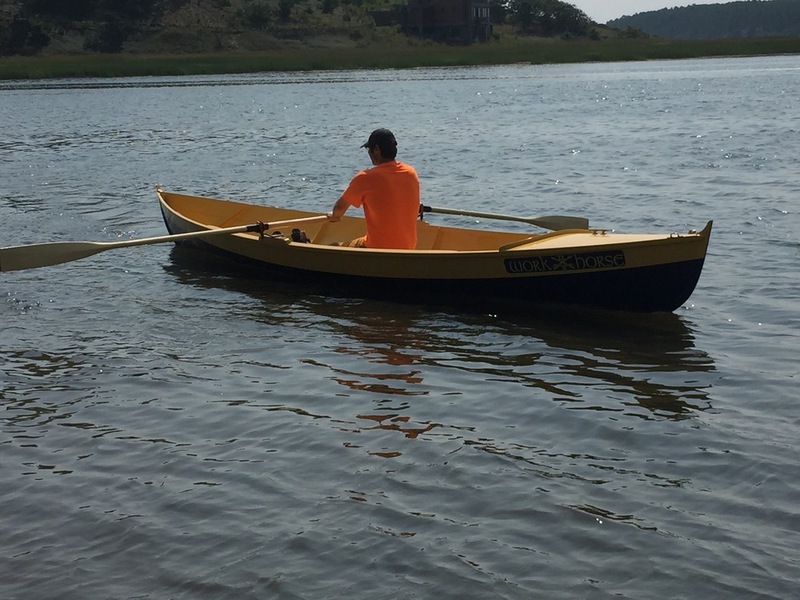 With the sliding seat, I had an easy time of slicing through choppy water and picking up very good speed. In wind and chop, like her smaller sister, she seemed to like it and want more. Of course performance is highly dependent upon the proper set up of the rowing stations and getting the ergonomics right, which is rower dependent. But the seat height, which is somewhat established by the side tank height, feels very good and more height can be gained by adding seat padding. 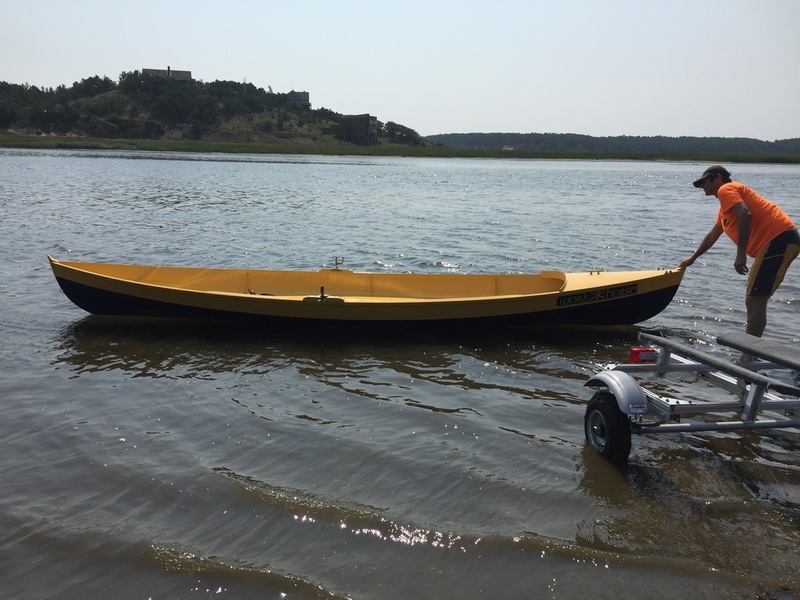 For two rowers, fixed seat rowing this boat in open water is a dream. She will take as much wind, chop, and waves as long as the rowers are strong and capable. In smooth water, the glide and stability will delight. Like the 17-footer, I expect she will win most fixed seat, double rowing races. Unlike the 17, she has a fore deck with a bulkhead underneath that creates an enclosed flotation tank in the bow. An aft deck and bulkhead can be added. Three frames and the side tanks create a very stiff structure for the hull. All planking is 6mm Okoume and timbers should be limited to Spruce and lighter hardwoods to keep her light. Hull #1 weighed in at 145 pounds, but we think it can be light with careful wood choice and construction. The Poseidon sliding seat rig is designed into the boat. The 7/8" Stainless pipes sit in the precut bulkheads. The footrest for the 19 is designed to be separate from the pipes so that the floorboards can roll up and lay out on the pipes acting as a sleeping platform. This tested very well during sea trials, and a long nap could have been had! A tent can be designed to go over the boat and make camping aboard very comfortable. If the rowers choose to go fixed seat, in lieu of the fore/aft pipes, wooden cleats are attached to the side tanks and the fixed seats sit on top. They can more fore and aft to adjust for trim.